When you really start fine-tuning your 3D printer, you might start to notice that even the smallest things can have a noticeable impact on your prints. An open window can cause enough of a draft to make your print peel up from the bed, and the slightly askew diameter of that bargain basement filament can mess up your extrusion rate. It can be a deep rabbit hole to fall down if you’re not careful. One element that’s often overlooked is the filament spool; if it’s not rotating smoothly, the drag it puts on both the extruder and movement of the print head can cause difficult to diagnose issues. For his custom built printer, [Marius Taciuc] developed a very clever printable gadget that helps the filament roll spin using nothing but the properties of the PLA itself. While the design might need a bit of tweaking to work on your own printer, the files he’s shared should get you most of the way there. All you need to do is print out the hubs which fit your particular filament spools (naturally, they aren’t all a standard size), and snap them on. The four “claws” of the hub lightly contact a piece of 8 mm rod enough to support the spool while limiting the surface area as much as possible. The natural elasticity of PLA helps dampen the moment that would result if you just hung the hub-less spool on the rod. 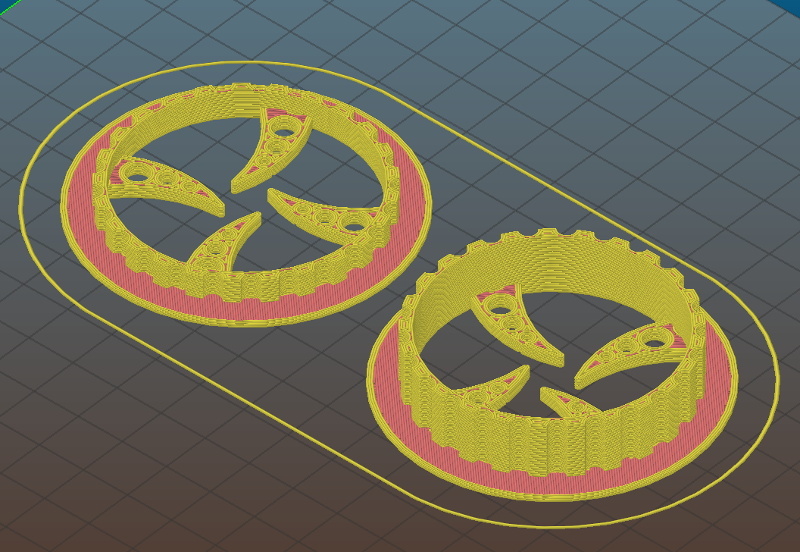 The STL files [Marius] has provided for his low-friction hubs should work fine for anyone who’s interested in trying out his design, but you’ll need to come up with your own method of mounting the 8 mm rod in a convenient place. The arms he’s included are specifically designed for his customized Prusa Mendel, which is pretty far removed from contemporary desktop 3D printer design. Something to consider might be a piece of 8 mm rod suspended over the printer, with enough space that you could put a couple spools on for quick access to different colors or materials. Hackers have been trying to solve the spool friction issue for years, and as you might expect we’ve seen some very clever designs in the past. But we especially like how simple [Marius] has made this design, and the fact that you don’t need to source bearings to build it. If you’re thinking of giving this new design a shot, be sure to leave a comment so we know how it worked out for you. I highly recommend against putting bearings in your filament spool holder. If it runs too smooth, it can “run ahead” if the printer feeder, due to the tugs of the print head, and then get more and more unspooled. Causing all kinds of issues, which result in print failures. That could be fixed with a ratchet mechanism. no it couldnt, because a ratchet only turns one direction and the jumping ahead to unspool is the correct direction. maybe a slip clutch would work. I meant the kind of non-locking “rachet” mechanism, don’t know what to call it, like you had a triangle with a spring against gear teeth. But anyway what Jason said about fishing reel, i don’t know how they work, but i would think not exactly like what i mean, so that’s another option. I used sealed bearings on mine. Enough friction to hold the spool from unraveling itself but not so much that they can’t spin with the spool. A reverse bowden tube from a fixed point on the frame running up to the entrance of the print head (left unconnected to allow for retractions) gives enough spooled out filament to allow for free roll without over rolling. I heavily disagree, bearings are absolutely useful however are only half of the solution. Running a feed tube to decouple filament length from head position is the other half, providing a constant fixed distance from head to filament spool means the only thing pulling on the filament is the extruder stepper, preventing overruns while still allowing for smooth feed and retractions. I can’t find any only-bearings in old HDDs, only a combined “hub” of motor, bearings and platter holder/table/shaft. Your looking in the wrong place. It isnt on the motor that tirns the disk. The bearing is on the arm but It can be pressed out fairly easily. Just print a disc with a hole in the middle, put aluminum rod through, done. Why a bearing? Are you planning on driving that spool down Route 66? I never even did that, just shove the rod through with no hubs to center it. It just drags along with no problems I think this may be one of those fixing an issue that doesn’t exist. Dragging filament can definitely have an impact on print quality. If you don’t have the issue, you have nothing to fix, but that doesn’t mean the issue doesn’t exist elsewhere for others. if your getting artifacts from pulling filament off the spool its not the spool that the problem.The lack of a guide tube to transfer the pulling forces away from the head and onto the frame that is the issue. The pulling force can jostle the print head without this. Setup correctly and with a good extruder one can pull from a spool sitting on the floor or as often in my case out of a ziplock bag for moisture control without any issue. Kinda depends how you look at it. The whole point of 3D printing is putting the right amount of material at the right spot. And the right amount of material is where it gets difficult. As material comming out of the nozzle depends on the pressure in the nozzle and the diameter of the nozzle hole. The pressure in the nozzle depends on how much force you put on it with the feeder, and the amount of force the feeder gives depends on the grip, which depends on a lot of factors. Including the amount of force required to pull the material from the spool, so you would want to keep that force constant for better flow control. Now, this is all in the range where you usually cannot really see it visually anymore, and thus you need a machine with a lot more sensors to actually measure these effects. Or, if you can see this effect, you have simpler fixes to do to get good results, like a stronger feeder. If your grip is slipping then all bets are of. Run bondtech and forget about it. as for invisible issues well, if there invisible then are they really there? Small reminder, I’ve been in this field for 7 years now. And one thing I’ve learned the last few years, that everything I know is wrong. Why does this all matter if you cannot see it? Well, there are multiple aspects of a 3D print. Depending on the usecase. Aesthetics is one of them, strength, dimensional accuracy, reproducability are others. And these all can suffer without visual impact. Do you no longer work on Cura? That would be a shame, it’s great software even for non-ultimaker printers. Or in other words, its more art than science. Im going to put my vote on the aluminum bar, in a good setup with just a drop of vaseline for the mech. and a cold beer to sit back and watch.. I like the way you said that, it reminds me of something out of “The Art of Electronics”. Isn’t it easier to source 608s than it is to source rods and cut them though? And then figuring out how to mount all this business? I’m a big fan of the TUSH. There’s nothing to mount, spool changes are super quick and friction is right where it needs to be. Low enough not to cause extrusion issues and high enough that tugs won’t cause the whole spool to unroll. The Tush was the first spool holder I tried, and I never had to try another one. In my opinion, it is perfect. 608 bearings are super cheap and you can use them for many other things. I ordered a pack of 50 and have only 20 left…It’s worth it having these in stock. All that plastic and threaded rod, so many wires… That is quite a build, compared to my $200 Ender 3, not quite 3 weeks old. Not sure you could tell if it’s the filament tugging, or something needs snugging. I’m just getting started, only two parts printed to be proud of, but learning, and getting better. I went straight to ABS, and it’s been fun figuring out all the problems and settings. Anyway, seems to me that what the spool is doing, is pretty well dampened, by the time the filament gets to the hotend. The extruder holds the filament pretty steady, and the resistance of the feed tube should smooth out the rest. Guess sometimes simpler is better… Besides, if it was a common issue, wouldn’t have been addressed by now? Maybe these fancy machines run faster, I’m finding that a slower print speed is improving my prints, seem stronger less brittle, but still not as expected. I bought cheap ABS, since I figured on many failures, but kind of suspecting it might be old stock, or something wrong. Next spool, plan on finding out who makes it first, and getting it direct, rather than save a couple of bucks, someone who might have dumpster dived to stock his online store. On my Ender 2 it was not the pressure or other effects of the filament, but how the spool would shake the entire machine when unspooling. I printed a thicker and longer pipe adapter, now it unspools smoothly. No bearings, just a better match for the spool. My first item I designed for 3D printing. It fits onto the top of the spool holder for the Monoprice Mini. The sharp PLA edges greatly reduce the friction of ABS spools VS running on the rounded, painted edges of the metal spool holder. The proper way to eliminate variations in filament tension leading into the extruder is to employ an auxiliary mechanism that pulls filament from the spool independently. This would eliminate tension variations due to spool friction, inertial, and filament cross wrapping differences. Such a mechanism should be able to detect filament unspooling issues (ex. tangles) that would normally cause a print to fail by “pausing” the print. Brilliant idea. Bearings are too smooth and the filament unrolls itself by spring force alone. Wish i had thought of this. I wonder how long till the slight friction wears ruts down and it springs out ? Maybe rev two will resolve this potential .